What do you know about organizational structure? 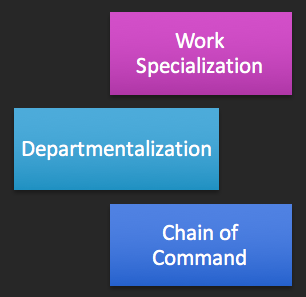 How job tasks are formally divided, grouped, and coordinated. To what degree are tasks subdivided into separate jobs? On what basis will jobs be grouped together? To whom do individuals and groups report? How many individuals can a manager efficiently and effectively direct? Where does decision-making authority lie? To what degree will there be rules and regulations to direct employees and managers? Now that you have spent time looking at the 6 elements of an organizational structure, please complete the following 6 questions. 1. Which element of organizational structure is characterized by the number of employees that report to a manager? 2. Which element of organizational structure is characterized by the basis in which jobs are grouped together? 3. 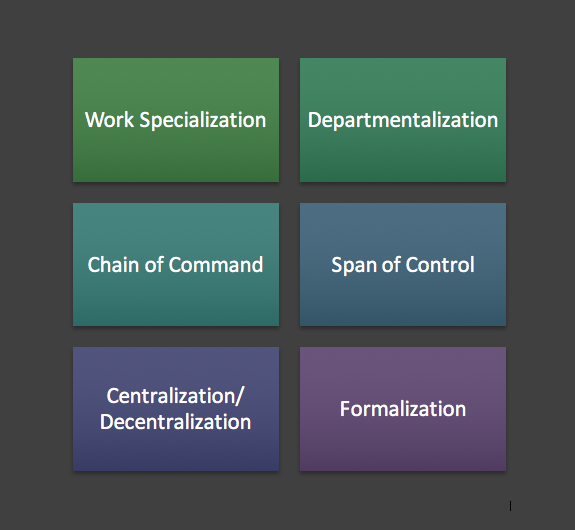 Which element of organizational structure states that tasks in the organization are subdivided into separate jobs? 4. Which element of organizational structure states that organizations can have decision making concentrated either at a single point in the organization or is distributed to lower-level employees? 5. Which element of organizational structure is characterized by a continuous line of authority that extends from upper organizational levels to the lowest level and clarifies who reports to whom? 6. Which element of organizational structure is characterized by the degree to which jobs within the organization are standardized? Congratulations! You have completed this online module. Breward, K., Langton, N., Judge, T., Robbins, S. (2016). 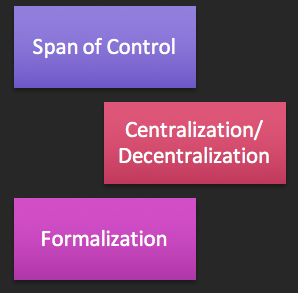 Organizational Structure. In Pearson Canada Inc. (Eds. ), Organizational Behaviour(454-485). Don Mills, Ontario: Pearson.